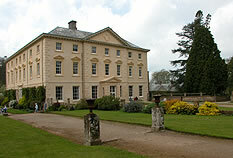 Pencarrow is a very much loved Historic House that is owned and cared for by Lady Molesworth-St.Aubyn and her family. The house itself is a 18th century Georgian mansion set in 50 acres of mature formal, landscape and woodland gardens that are open to the public at various times throughout the year (details of which can be found on the Pencarrow House and Garden website). There is plenty to do for all the family, including tours of the House, walks in the Gardens and refreshments at the Peacock Cafe. There is entertainment for children around the house and gardens with numerous Peacocks and other fowl running about as well as Strawberry picking when in-season. Pencarrow is very 'dog-friendly' providing their owners are kept on a lead. The gardens that are on view were originally laid out by Sir William Molesworth between 1831 and 1855 including a beautifully proportioned sunken Italian Garden and landscaped grounds. The gardens were extensively replanted by Sir Arscott Molesworth-St. Aubyn during the latter part of the 20th Century to include more than 160 different species of specimen conifers, 700 different Rhododendron hybrids and more than 60 different Camellias - many of which have survived and can be seen in the gardens today. There are wonderful walks through the grounds including a beautiful lake and an Iron Age hill fort. Snowdrop Sunday - Galanthus Galore! You can find out the dates and times of specific events this year on the Events at Pencarrow page. The gardens contain a beautiful lake and the grounds also contain a well-appointed shop selling books, Bonsai equipment and much else besides. In addition there is a nursery area with many plants, trees and shrubs for sale.